Ailsa at http://wheresmybackpack.com/ has chosen the theme of night this week. The photo I am posting was taken at Jemaa El F’na in Marrakech which has been recognised by Unesco as a ‘ Masterpiece of the oral and intangible heritage of humanity’. Beautiful and bustling by day with orange juice sellers and caleche rides, at night it really comes alive. There are snake charmers, story tellers, healers and tooth pullers. In the evening the food stalls arrive, you can choose from a vast array of delights, all cooked on the spot and filling the air with steam and smoke. Be sure to check a few before you decide, of course they will all do their best to tempt you to take a seat, but if you check where the locals are eating you can’t go far wrong. At the back of my photo is the minaret of Koutoubia mosque, the largest in Morocco, but not open to non Muslims. When I was a child, I was entranced by the Crosby, Stills and Nash song, Marrakech Express and as I write the lyrics are buzzing through my head. When I finally went for the first time, four years ago, it was a dream come true. I’ve been back since and will again. 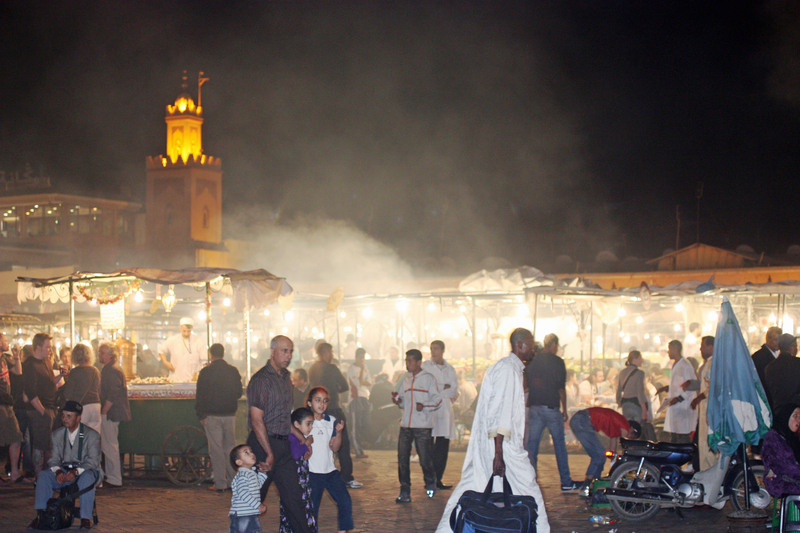 Marrakech doesn’t disappoint, it’s magical and La Place Jemaa El F’na at night is a vibrant, chaotic, smelly and noisy sensation. Sadly in 2011 the square was bombed, killing fifteen people and injuring more. The blast destroyed Cafe Argana, one of my favourites, a great place to sit back and enjoy the spectacle. I have never heard if it has been rebuilt, so if anyone has any information could you share please? I would love to know. That pic has SO much atmosphere Gilly! Hahaha I should have guessed! Please can I follow you around the world? you have been to so many more places than I have but we have just the same taste in destinations. I debated posting a close up food image and a few more but decided to stick with one. I’m sure your will be better than mine! Nah, mine are terrible, or they would have already been up there by now 🙂 R was in charge of photos then and his camera skills appear to have been worse than mine! I didn’t take photos of this square when I visited Marrakech, but I stayed in a hotel opposite the Koutoubia Mosque so visiting the square was a nice evening stroll. A fascinating city, I thought, with very brave drivers! The gold light on the mosque is so striking – very nice! Beautiful place, Gilly. So sad about the bombing. I love the light in the mosque…it looks magical. This photo is filled with adventure. A fabuous entr for the challenge. You have photo’s that only a photo journalist would have. These are so story worthy. You must write a tale about this adventure real soon. You just love to tinkle our curiosity. As a young person, I used to dream of going to places such as this. Had to go and find it !! !